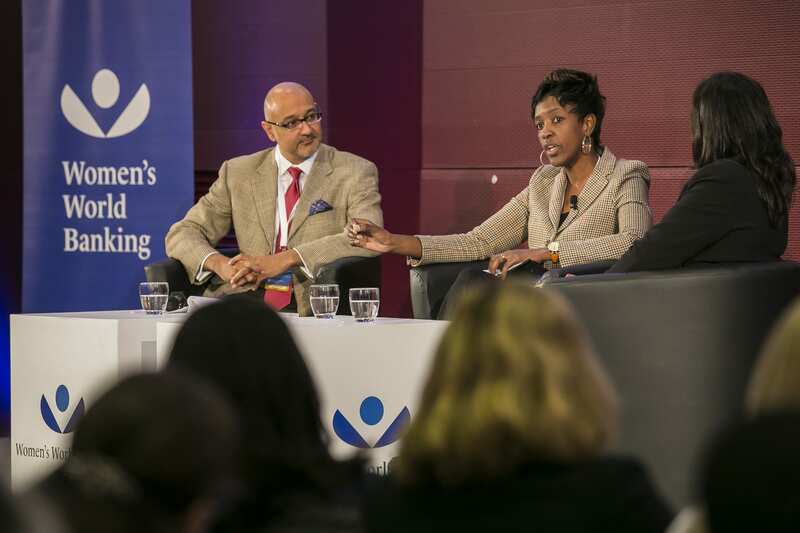 The Women’s World Banking Making Finance Work for Women Summit, held in Berlin this past November, considered financial inclusion for women from multiple angles, including perspectives from outside the financial sector. One particularly lively discussion took place between Suneet Varma, President and General Manager of Pfizer Consumer Healthcare, and Debra Mallowah, Vice President of Personal Care with Unilever Africa, during the “Targeting the New Growth Segment: Women” panel moderated by McKinsey’s Lohini Moodley. This begs the question of how to sustainably target women at scale? For Pfizer the first step was to make the business case to the company’s management team. Only then were women in middle-lower sections of the socioeconomic pyramid – Socio Economic Classes (SECs) C,D,E – embedded into the company strategy as core targets. As part of this journey, Pfizer adjusted its offerings to appeal to these new segments. Initial steps included developing smaller sizes of popular products to make pricing more accessible and identifying ways to reduce the number of ingredients in some formulas to decrease cost. From Unilever’s perspective, the most critical step when targeting women is to truly understand your consumer, particularly what motivates her. To do this, Unilever sees great value in using research to develop an understanding of her psychographics, meaning what drives her in terms of life stage, social index and other factors. This deeper level of understanding can enable brands to develop products that offer the consumer real value, which in turn can build loyalty and command higher prices. An example of this is Lifebuoy, the world’s #1 selling germ protection soap. While many soaps fight germs – soap is essentially a commodity – Lifebuoy “helps more children reach their 5th birthday.” Rather than simply communicating the product’s functional benefits, the marketers behind Lifebuoy took steps to understand not only the importance mothers place on the health of their children, but also how they prioritize time and perceive value. The marketing team realized that Lifebuoy could offer its consumer value by reducing the time she spends tending to sick family members. Equally as important, Lifebuoy helps her feel safe, secure, and that she’s made the right choice…all thanks to a soap. As a result of this strategy, even lower-SEC consumers will pay more for Lifebuoy, because they see value in the investment. While Lifebuoy’s story is one of success, equally powerful lessons sometimes come from failure. In the spirit of sharing both sides of Pfizer’s journey to successfully serving lower-income women, Suneet gamely spoke of an all-too-common pitfall that even world-class marketers can occasionally fall into: the trap of assuming that a product that does well with one segment will be equally well received by other segments. In Pfizer’s case, the product was Centrum multivitamins – their best-selling consumer health care product worldwide. Centrum was very popular among upper income women (SEC A&B), and Pfizer assumed that offering it to lower-income CDE segments at an attractive price would be a natural step to drive growth. Pfizer developed a smaller size package and sold it in to retailers. Unfortunately their assumption proved wrong, and the product sat on shelves, unpurchased. In their quest to understand why, Pfizer’s marketing team ultimately identified a key motivational difference between their upper- and lower-income consumers. They found that upper-SEC women targeted by Pfizer typically have a long-term outlook on well-being, which makes products like multivitamins highly appealing. Women in lower SECs, however, are more focused on their immediate need state and don’t see vitamins as worth the expense. They are more likely to find value in fast-acting products like pain relievers and melatonin. With Centrum, Pfizer failed to recognize that low-income women might have different needs and motivations than their high-income peers, and thus did not do the research necessary to understand these differences. Fortunately the company quickly learned from its mistake and soon solidified its position as a leader in this space. To really build a relationship with women consumers and “create the love,” Debra spoke about the importance of “joining her circle.” By acknowledging that women use each other as experts and joining the conversation, brands can learn a great deal. In many markets, both Suneet and Debra agree that digital strategies can play a powerful role as women share with others online about what they are buying, selling, using, and why. Traditional trade also remains an important tool, as one-on-one customer service is still highly valued by consumers in many markets, including those in which Unilever Africa operates. Debra pointed out that it is important to consider all aspects of the point-of-purchase experience, from the sales conversation to environment and imagery, since all have the potential to help a brand connect with the consumer and demonstrate that it understands her needs and values. A clear business case for targeting a new segment can be a catalyst for institutional alignment. A genuine, deep understanding of the consumer can give a brand the power to turn a commodity product, whether soap or a savings account, into a must-have that leaves its competitors behind. Never assume you know what motivates your target consumer – join the conversation with her and find out first hand. Consider the point of purchase, whether a supermarket, bank branch or digital interface. All touchpoints should speak to the consumer and demonstrate the brand’s understanding of her. Do you see additional implications? Please share your thoughts with us on Twitter or Facebook and join the conversation. To watch Debra and Suneet’s full discussion, check out the video here.